Hi Lauren. Elementary school cafeterias have got to be one of the nosiest, smelliest places that a child encounters. Throw on top of that ASD and SPD and you’ve got yourself a real challenge! Noise reducing headphones or ear plugs. Many kids with ASD have trouble with loud sounds and find headphones to be helpful. However, if you’re looking for a more subtle approach, the ear plugs can be helpful. I currently work with a four-year-old who knows how to put his own ear plugs in so when he feels things are too noisy he can take care of it right away. Even if she’s not able to put them in herself there may be a teacher or aide there who can assist her. Work with the school to determine which area of the cafeteria is least noisy and furthest away from the food service line. There will still be noise and the smell of food throughout the room but there may be some areas less impacted than others. For example: try a corner, or a seat near an open window. If she has a 1:1 aide, consider asking the school if there is another room she could eat in with her shadow. Maybe they can eat in an empty classroom then join her peers for playground time. 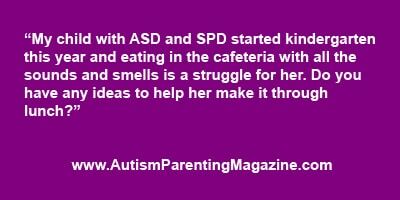 If there are other children who have sensory issues related to the cafeteria, maybe the school can consider creating a “Lunch Bunch” for special needs students to eat in another room. This way she would not be alone and would still be able to benefit from the social aspects of lunch time at school. One blog found through the Brain Balance Center has suggested putting a vapor rub cream under the child’s lip to block out any other smells. The strong scent of these rubs will overpower the dozens of other food smells present in the cafeteria. Additionally, I would suggest you investigate how much of the issue is sensory related and how much may be behaviorally related. Does your daughter eat just fine at home, or is it a struggle for her? If eating itself is a battle because she’s picky or doesn’t enjoy food she may be having adverse reactions to lunchtime as a way of escaping. If this is the case you will need to create ways to motivate her to eat during lunch time. A “First-Then” contingency. You can even make a simple visual showing her first she needs to eat, then she can play on the swings, or then she can have her pudding, etc. Keep it basic and make the expectation reasonable. Think about decreasing large portions or serving her neutral foods instead of highly non-preferred foods. Token systems. You can have a sticker chart, hand drawn picture, or even Velcro pieces to reward her eating. One bite earns one token. Ten tokens equals recess time, dessert, iPad time, etc. This is similar to the “First-Then” contingency except with a token system you are providing immediate reinforcement per bite (the token) rather than waiting until the entire meal is finished. We hope this helps and that you are able to collaborate with your daughter’s school to make lunch time more tolerable for her. Best of luck! Angelina M. works as a Board Certified Behavior Analyst, specializing in treating children and adolescents with autism, down-syndrome, and other developmental delays. She began her career in Applied Behavior Analysis in 2006, following her youngest brother’s autism diagnosis, and has since worked with dozens of children and families. She also writes a blog about her experiences as both a professional and a big sister. Her brother, Dylan, remains her most powerful inspiration for helping others facing similar challenges.